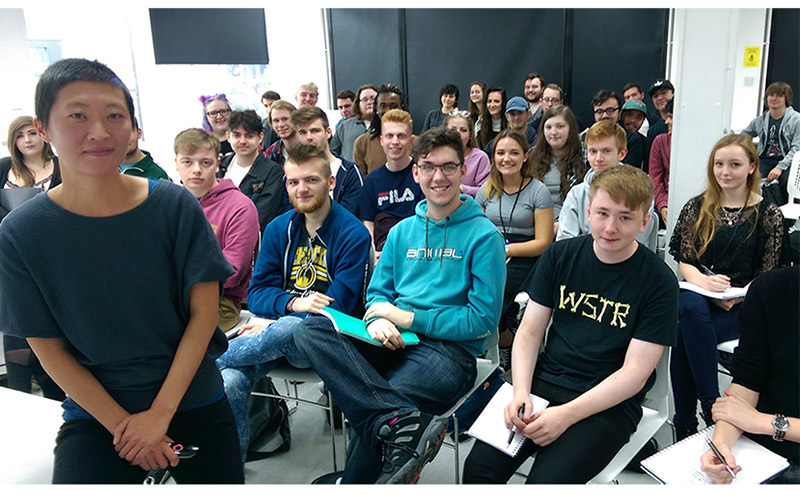 “If you plan everything carefully and can persuade and motivate the right people, you can make whatever you want without a big budget.” That was the message of VFX animator and filmmaker Magali Barbe on a visit to NUA. Magali made headlines this year with her own short film “Strange Beasts” – a prophetic film about Augmented Reality and addiction. The film featured at a number of festivals – Saatchi/Saatchi new directors, LA Shorts, Exit6 festival, and festival du Film Merveilleux & Imaginaire – and was chosen as Vimeo’s Staff Pick of the Week. The film was made in Magali’s own time – while working on the movie Wonder Woman. She explained to students how she begged favours from animator friends and persuaded Framestore to allow her to film scenes on the premises. She worked as a previs artist at MPC, and worked on Avatar and Fantastic Beasts. She was previously a creature animator at Framestore, a character animator on Halo 4, and worked on Charlie Brooker’s Black Mirror.